The percentage value will be calculated and shown visually as both a number and a fraction. You can also enter a percentage here to get the fraction for the current total! This section shows different ways you might think about or speak the calculated percentage relative to the values you entered. Here's an example... Go ahead and enter your own percentage or fraction to change the calculation. When you're done, you can copy the URL shown here to save this calculation exactly as you see it, then share it with a friend or student! PARTIAL is PERCENTAGE from a total of TOTAL. PARTIAL out of TOTAL is PERCENTAGE. PERCENTAGE of TOTAL is PARTIAL. The fraction PARTIAL / TOTAL is PERCENTAGE. Because percentages are by definition fractions out of a hundred, if you leave the denominator blank, the calculator will supply 100. If you want to use a different denominator, simply enter the denominator first then, a percentage. For example, to find out what 40% of 200 is, enter 200 in the denominator and then 40% in the percentage to get the result. The calculator will approximate percentages to two decimal places, but you'll see the percentage to a larger precision if the calculator rounded it where the main results are presented. What value out of a whole equals a certain percentage? What percentage is some amount out of a whole? What fraction equals a certain percentage? Playing with this percent calculator and seeing how different fractions and percentages change these verbal descriptions will help you understand percentage concepts thoroughly. If you wish to save settings you enter in the percentage calculator, the “Share this Percentage” link can be copied and pasted into an email, your browser bookmarks or a web page. It will return to this percentage calculator and show the problem exactly as you see it. 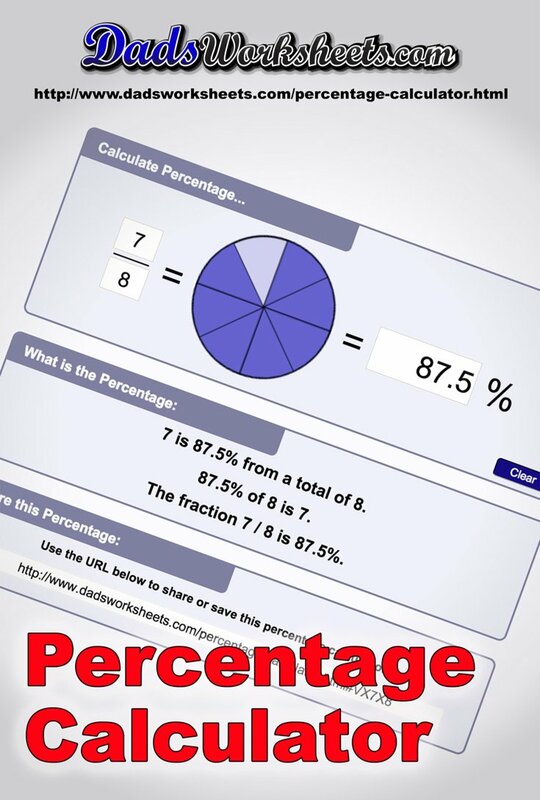 A percentage is a useful way to conceptualize a fractional amount of some total in decimal form. We deal with fractional amounts regularly, but often fractions have different denominators which makes comparing them difficult. A percentage by definition is a fraction with 100 as it’s denominator, so comparing two percentages is easier than comparing two arbitrary fractions. The word “percent” has the Latin root word “cent” in it, which means one hundred. This is the same root word in the English words century or centimeter or centennial, and it of course relates to the monetary cent which is one hundredth of a dollar. The Latin root word in percent should help you remember that percentages are always fractions of 100, and you can find all sorts of other interesting words related to hundreds and percentages if you pay attention. See this link for some more details… Where does the word Percentage come from? …but here on this calculator page, we’re dealing with math! Those hundredths denominators are very important and they relate directly to using percentages and our decimal numbering system. Percentages are directly to numerical values and back by moving decimal places. Note that 100% is the same as 100 parts out of a total 100, which is of course one. That makes sense. If you have 100% of something, you’ve got all of it, not a fractional amount. Notice in that last example how we started with a real number greater than one, and after moving two decimal places, we calculated a percentage greater than 100. Percentages are fractions of 100, but those fractions can be improper. So 125% is a perfectly fine percentage, it’s just representing a value greater than a whole. You’ll see values like this often when you think about percentage difference amounts, for example if one item costs 125% of another. Calculating percentages is easy if we know what the total number of something should be, and we’re comparing it to what number we have. Calculating percentages is much like making a fraction, and then, no matter what the total was, just making the denominator 100. Calculating percentages can be more difficult if the total amount (the value we’re starting with as a denominator) isn’t a factor of 100. That’s what this the fraction to percent calculator on this page does really well for you! Just enter whatever values you need and you’ll get a result, probably as a percentage with a decimal. You’ll be converting fractions to percents with zero stress. When you are learning how to find percentage differences between numbers, for example determining the percentage change from one value to the next, you are looking at the difference between two values. The important amount is the net change between the first value and the second, so the first step is subtraction. For example, if we started the day with $10 in our pocket and we ended with $15, then the difference (the change) is $5. If we know the amount of difference, how do we calculate the percentage increase? Are you looking to practice your percentage calculator skills? There are a number of great percentage worksheets on this site at the links below!